Today's Free GM Resource isn't going to be to everyone's tastes, but then again, this could be said for any other Free GM resource. Kismet's Dungeons & Dragons pretty much feels like just one GM's (ok....DM's) personal website being used to keep track of campaign-specific details. I originally stumbled across this site years ago when I was looking for some information on how to value slaves for my campaign. Personally I found Kismet's Guide to Slave Costs quite useful. There are also pages with GM DM information in the form of tips & tricks. Sometimes when I see things like this the information comes off as preachy in a "I'm smarter than you" types fashion. I didn't get that here. I won't go into everything available on the site, but will mention there is some great info on coming up with names, as well as a huge list of fantasy names. 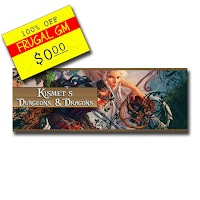 Kismet's Dungeons & Dragons has a lot of good info you might find useful for your current, or future campaign.